/ How Can I Speed Up LED Programming? How Can I Speed Up LED Programming? A Conventional Lighting Console. From John Lemieux on Flickr. 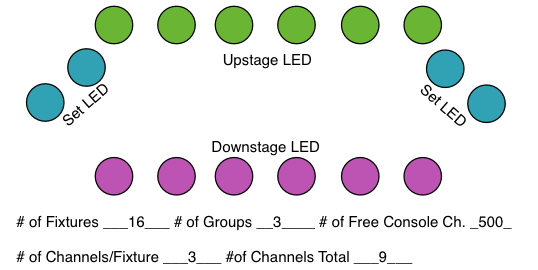 Have you ever found the need to compress down the number of channels that your LED fixtures take up? Maybe you’re using a basic 2-scene lighting console, or just need to keep down your channel count to stay within the limits of your desk. How should you best manage this channel situation? 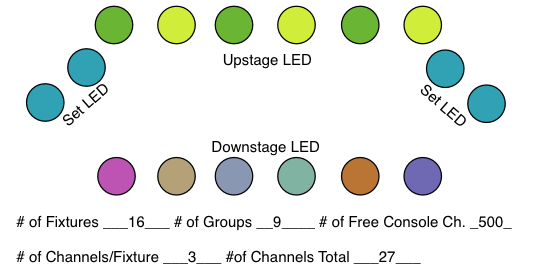 Note: don’t tune out even if you have an expensive moving light console or a console that can handle all your LED’s with a unique patch- this post will teach you how to group fixtures in your pallets. What do you do with all these LED’s? When I started in the lighting industry, I spent a lot of my time at small festivals and county fairs programming par can rigs when suddenly “the boss” made a big investment in LED fixtures. All of a sudden, I was constantly taking at least 6-12 LED fixtures to any job that had limited power, and it was great. The problem came about when addressing them. As I was first taught, we needed to address the LED cans in groups, not uniquely, because our par-can-optimized consoles only had so many fader. Even the big, 96 fader 2-scene console had a limit somewhere when all of the LED lights took up 6 channels each! So how do we group fixtures so that we can create a visually pleasing show, have the most flexibility and use up as much of the console as possible? Below, I have created some simple drawings of a basic stage. The circles are the lights, and the colors represent different groups of lights. When all of the fixtures are on the same DMX address, they will all do exactly the same thing from the console. Not very exciting, eh? Next, we go and split the upstage and downstage fixtures. I put the set pieces in the group with the downstage fixtures since they are both lit from the front. Following along okay? Notice the numbers at the bottom, which will help you quantify when you’ve used your system to the max. Good. Now, here we’ll split the downstage group off from the set piece LEDs. And now we split the upstage fixtures in 2, creating some fun multicolor looks. The beauty in this is that it allows us to make both multicolored looks and monochromatic looks, creating more variety. The last grouping we’ll do is splitting up the front fixtures to individual control. This way we can light solos and make some cool color combinations on our stage for the pre/post service looks. After this point, you can split up your fixtures further, but I think you get the point from my previous drawings. Don’t forget, if you do have a nice moving light console that can split every fixture as it’s own self, use this guide for when you generate your groups for selection. It’ll help you to select things much faster when programming. If you dropped off this post early, consider looking into the option of buying a new console next time you are making a lighting gear purchase. If you frequently are adding to the size and complexity of your lighting, buy a console that is bigger than you currently need so that you can grow into it. Check out this post for more on lighting consoles.